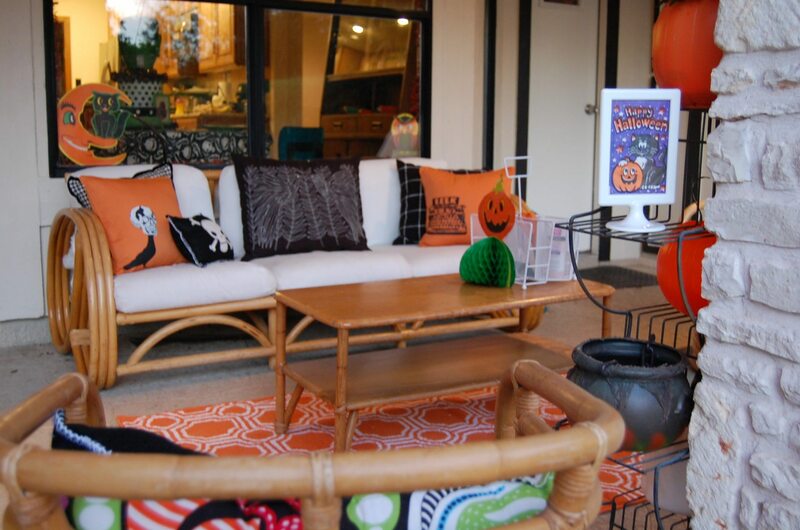 I’m already my planning my Halloween porch and patio are you? I realize it is still August, but amazing porches, patios and front doors take planning. Today I’m sharing a few pictures of my Halloween themed House front and back through the years and even through two different houses. It is hard to pick a favorite. Remember that year that crashed witch legs were all the rage? Ya, I cut up some pool noodles and went there too. The difference is mine crashed into a shopping cart. Read more about it here. Last year was my first Halloween in my new digs. 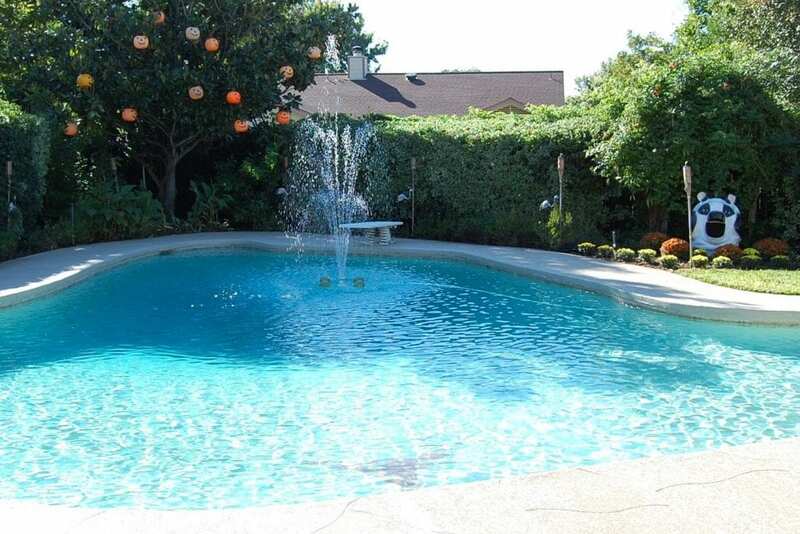 Making a pool look spooky is something I am trying to figure out for this year’s annual Halloween party. I did however think my magnolia tree looked great covered in plastic pumpkin buckets. Hot tip – drill holes in the bottom in case of rain. Otherwise the buckets get heavy and weigh down branches. 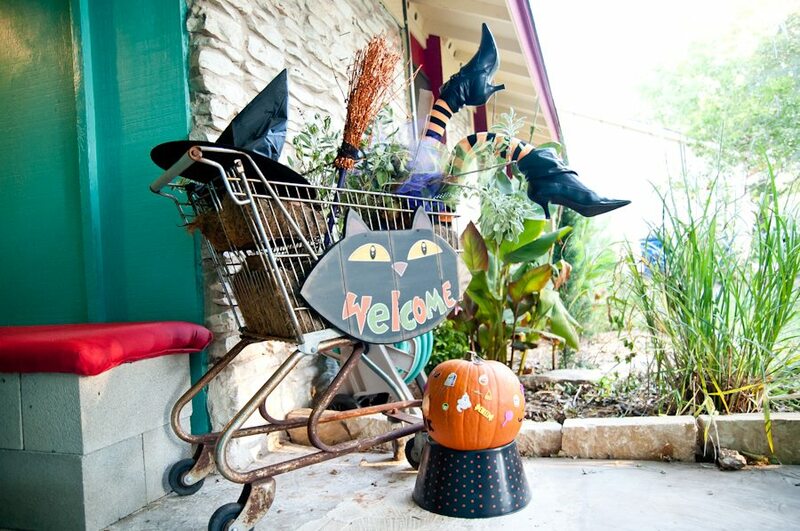 My beloved shopping cart makes another Halloween appearance. I really liked this set up because with a few minor tweaks this arrangement transitions into fall and carried me all the way through until Christmas. The year of the Halloween rainbow. 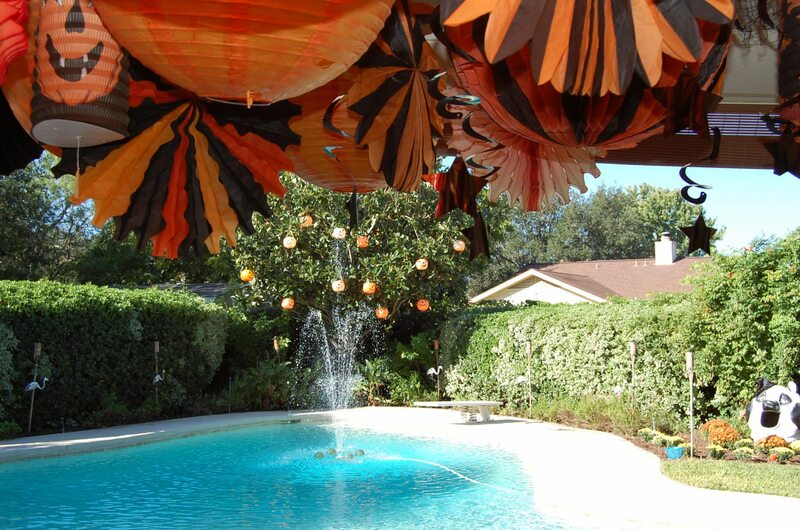 I always love these colored pumpkins and they looked great in front of my old hose. Pop an LED candle inside and get your rainbow spooky on. 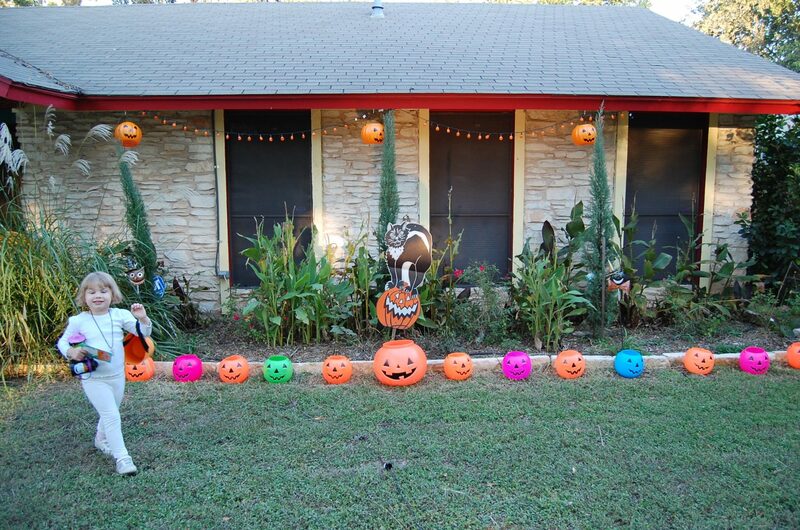 Last year I was pretty in love with my Halloween back patio. It was cozy, cute and festive. Holiday decor does not have to stop at the front door. I spend way more time on the back porch so it only makes sense to spread the spooky joy out back. Want to make some of those spiffy stenciled pillows for yourself. Check out my tutorial here. So which year was your favorite? I’m having a hard time choosing. More importantly I’m having a hard time deciding what to do for this year. Any pool decorating tips? I’m thinking of sinking a faux pirate ship for my annual party. hmmm, so many choices. 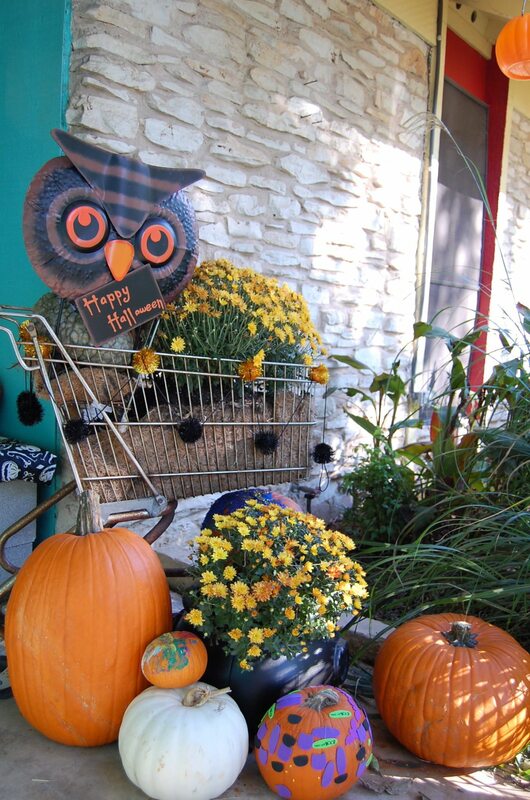 Posted August 6, 2014 & filed under Crafts, Halloween, Holidays, Plant Crafts. So glad you like the patio. I’m hosting the 6th annual this year (have been planning for months). 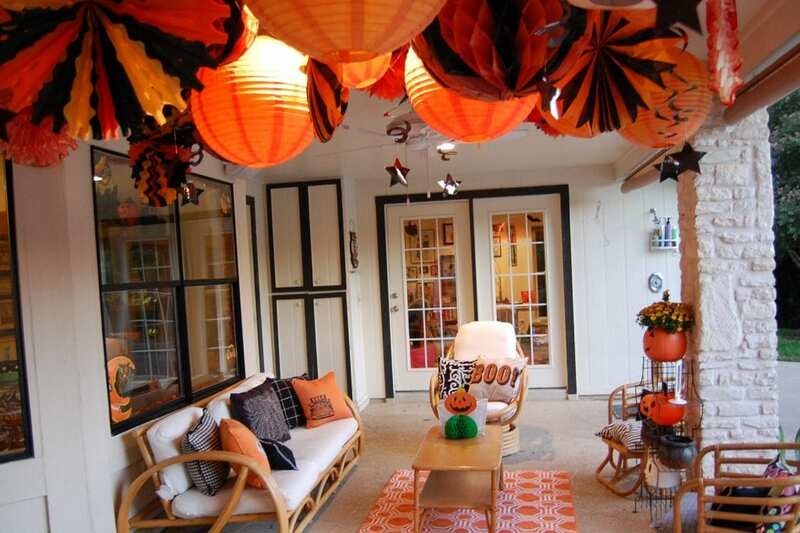 Not sure how I will top last years patio, or where I will put all those paper lanterns and pinwheels this year. Keep your eyes peeled, I’m sure I’ll blog about it!! !